Bowood Park Hotel & Golf Club is one of North Cornwall’s finest venues, welcoming diners all year round. 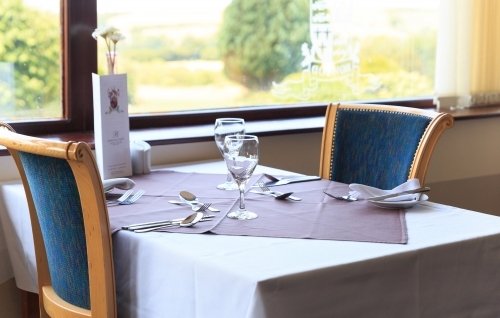 Whether informal or indulgent, for business or for pleasure, celebratory or post-golf or simply for Sunday lunch in North Cornwall - our range of dining experiences offers fresh, locally sourced ingredients, prepared to order. Our Bowood Park restaurant & function room is designed in a traditional style with the emphasis on luxury and elegance. Offering natural light and wonderful views with capacity for up to 120 people, it is in the ideal setting for all occasions and offers guests a dining experience, using locally sourced, fresh produce, beautifully presented by our Head Chef and his team. At Bowood Park our team offers an exceptionally high standard of service and will work closely with you to make your day a complete success. Whatever the nature or size of your event you can rely on the skill, enthusiasm and dedication of our experienced team to ensure your event runs smoothly. If you are looking for a more relaxed, informal dining experience, then The Clubhouse Bar is ideal. The menu provides you with a selection of simple snacks and comfort foods and overlooks the Putting Green & 18th green on the Course. If you would like more information regarding any of these events or would simply like to view any of our rooms, please call on 01840 213017 (ext 4) or email info@bowoodpark.com to arrange a visit.